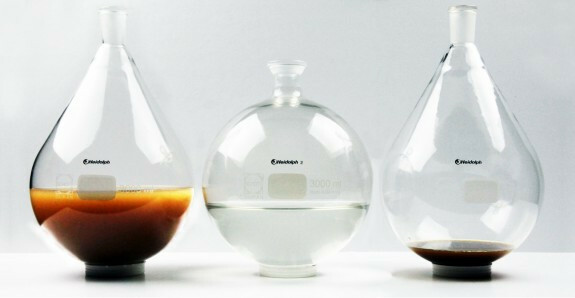 At StarChefs.com ICC 2011, we distilled apple cider using the Rotary Vacuum Evaporator. While we were hoping to use the distillate to add a hint of apple to a recipe, we looked over at the other flask and realized what we had done. We had created an absolutely pure and rich apple butter. It spread like warm caramel and felt like someone punched you in the tastebuds with an apple tree. The reduction has fast become a fall favorite around PolyScience. As far as the apple distillate, well, that goes into the ice tray and plays a tasty role in several fall cocktails. Clean and sanitize all glassware. Air dry thoroughly. Carefully funnel 1 liter of apple cider into 3L evaporator flask and clamp to the vapor tube of the Rotary Vacuum Evaporator. With the water bath at 45°C, and the condenser temperature starting at -10°C, apply full vacuum and rotation of 160 RPM. Distill until evaporating flask has reduced apple cider to a honey-like consistency, approximately two hours. DO NOT LET BOIL OVER. “Bumping” will contaminate your glassware and receiving volume. This will require you to start the entire process over. Remove clamp and receiving flask. Transfer distilled apple cider to a clean vessel or vacuum seal. Distillate can be refrigerated for 2 weeks or frozen up to one year. Use as an addition to cocktails or poaching liquid. Can also be frozen in cubes to add an apple perfume to mixed drinks. The distillate will have no sweetness, as all sugars stay in the concentrate. Remove and carefully transfer concentrated apple cider, now apple butter, to a clean vessel or vacuum seal. Apple butter can be refrigerated for 6 weeks or frozen up to one year.